Add water one drop at a time into the hardened clay. Slowly knead the water into the clay after each drop. You can also wrap the clay in a damp paper towel and return it to the container. Seal the top and let it sit overnight. Since when was it good to do something poorly? Since the award-winning game of Cluzzle turned sculpting on its head! 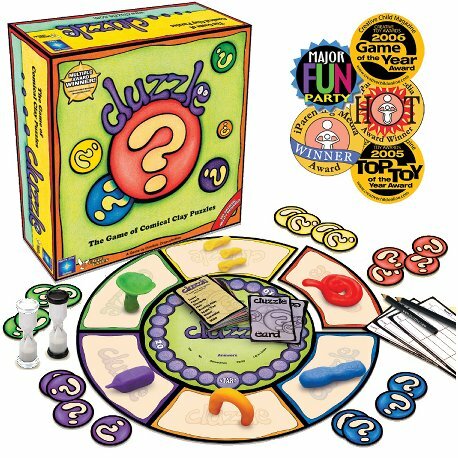 Cluzzle is a deduction game similar to 20 Questions. Donâ€™t be too good an artist - the trickier your sculpture, the more points youâ€™ll get! The result is a game which anyone can win that inspires creativity, intrigue, and social interaction. So grab your friends and family. Your ridiculously poor sculptures will inspire laughter that will be remembered for years to come! Cluzzle has already received 5 different awards as one of the best family games on the market. It is rated above Pictionary as the #1 drawing and sculpting game of all time by industry experts at www.about.com making Cluzzle a perfect gift for the holidays. I've been eagerly awaiting the release of Cluzzle for a long time now. One reason is that it's designed and published by a friend of mine, Dominic Crapuchettes. Besides this, I also wanted a copy of my own after having so much fun playtesting it back in 2002 at our Protospiel game designers convention. No other game from that year's event generated so much laughter and excitement. It's been a long time coming for Dominic, but we received our first shipment of the game a couple weeks ago. I'm very happy to say the finished product looks great and the gameplay is as good as I remembered it. A "cluzzle" is a clay puzzle. The idea of the game is terribly simple actually. Players pick an object from a list on cards and they sculpt that object. The best scoring cluzzle will be one that's guessed in later rounds, but players will score no points for their cluzzle if it's not guessed at all. The idea is to be somewhat tricky in your representation, but not too tricky. After all cluzzles are sculpted and displayed on their "claystations", a series of rounds is played out. Each round, each player gets to ask two yes/no questions. These questions are asked and answered with no particular turns. Table talk is encouraged, so you don't have to just say "yes" or "no" when answering. Guesses can be written down for the cluzzles anytime during the round. When everyone has asked a question, or when time has run out, the round ends. At this time, players read off their guesses. Correct guesses earn a the sculptor and the guesser(s) one point in round one, two points in round two or three points in round three. Since the session only lasts three rounds, you're fresh out of luck if your cluzzle hasn't been guessed by that time. A complete game lasts three sessions. Our games have been completed in 30-45 minutes. Many gamers will likely recognize similarities between Cluzzle and the classic German game, Barbarossa. I've talked to Dominic about the game enough to know that the core idea for Cluzzle was inspired from playing Barbarossa. What Dominic managed to do with his game, though, is take those fun elements of Barbarossa and put them into a game that's more accessible to non-gamers. In the time since I've had Cluzzle, I've played it enough with non-gamers to know this to be the case. As much as I enjoy Barbarossa, I find it has too many rules that I have to keep pointing out to new players throughout the entire game. In contrast, Cluzzle is so simple most people just start playing. As it is now, I bring Cluzzle with me whenever I may be playing games. It works well with many styles of play, from extremely light party gaming to more competitive deduction, though I don't suggest mixing both of those styles in the same group! Finally, a group game where everyone can participate, enjoy themselves, and think outside the box. It's hands-on, rowdy, and definitely the next "big thing" in gaming. It worked perfectly as an ice-breaker game and is just as fun amongst friends who have known each other for years. Mold on! Cluzzle is definitely one of the best party games I have played. The game is highly addictive. I bought this game about 5 weeks ago and have already played it with friends and family over 10 times. The mechanic of making your sculpture somewhat difficult to guess seemed a little odd to us at first, but I think this is part of what makes the game so great because it appeals to people of all different artistic abilities and helps create humorous situations. This was a great party game, a lot like charades and great for most ages. It takes some thought and depends on how well you can mold clay. I give it a 10 out of 10. I can't believe I found this game online! I played it for the first time last weekend. It was brought to our group by someone who knows the brother of the game designer. It was definitely the most fun game of the evening. The basic idea is that everyone makes a puzzle out of clay for others to guess. The trick is that the longer it takes for people to figure out what you made, the more points you get! The pure absurdity of it had us on the ground laughing several times. Definitely a good game to get people laughing. At the same time, there was enough strategy that we all wanted to play again after the first try. This is the coolest new game I've seen for several years now. Back in the summer of 2001, Terry and I took a long drive to West Virginia to meet with some other game designers at Stephen Glenn's first Protospiel event. Over the next few days we made some great friends. Dominic Crapuchettes was one of them. Dominic's strategic mind and his skill for designing solid games was immediately evident. Each summer since then we've come together to playtest our prototypes and share thoughts on game design. As with all of our friends there, it's been exciting for me to see Dominic's ideas develop and come to fruition over the years. Last summer he told me he'd be releasing his first published game under his new company, North Star Games. I was glad to know of this at such an early date and, consequently, to be the first retailer to offer his game online. Along with the release of his game, we've planned a special giveaway and he agreed to the following interview. Be sure to check out Cluzzle, the first design from a guy whose name (as long as it is!) will eventually be well known in the industry. Mike Petty: Please start by telling us a little bit about yourself. Dominic Crapuchettes: My background has a strange mix of diverse endeavors. I captained a rowdy Alaskan fishing boat during the summers to pay for an impractical liberal arts education where we read Homer, Plato, Newton, Tolstoy, Einstein, and other mind boggling intellectuals from the western tradition. During my free time, I played soccer, basketball, the piano, and any board game I could trick my friends into playing. I also followed the Magic international pro-circuit for several years, culminating in winning $15,000 in New York. MP: So you likely could have excelled in many different careers or businesses. Why have you decided to start a game company? DC: After graduation, I tried my hand at several jobs, but always dreamed about starting a game company. Designing games was something that I had enjoyed throughout my childhood. One of my early designs was actually banned from 8th grade when a group of 30+ students started playing during classes. It was called "Kabloogi". I became interested in economics while my girlfriend was in a public policy program and studied accounting and finance to help get into a good business school. When I received an entrepreneurship scholarship based upon my business plan, I decided to start my company while still in school. Although I am passionate about team sports for physical exercise, one of my favorite pastimes for intellectual exercise has always been playing board games with a group of great friends. I am particularly good at strategy and communication games but I also love word and knowledge based games. I am a very social person, so playing solitary games on my computer is not a viable option for very long. Part of what I want to do with my company, is promote board games as a viable mainstream form or entertainment here in the United States. It is one of the cheapest and most wholesome pastimes ever invented, which is perhaps why is has been around for thousands of years. MP: I've got to ask more about that game you made in eight grade. What was it like? DC: Kabloogi is a two person wargame that I created in 1982. Part of the great innovation was that each player got 4 moves a turn. Since that time, Kramer and others have started using that same mechanic with games like Tikal. At that time, we used graph paper to play. Each player would get half of the paper, take it to class, and set up their side of the board. Then we would tape the two halves together and start playing. I would make one move during class, then I would give it to my opponent who would make his move during the next class, and so on. Once the group of people playing the game increased to over 35 students, the administration decided to crack down on it. MP: Too bad no one noticed the creativity behind it! Let's say you were having some of your gaming friends over for game night. What sort of things would you bring to the table? DC: Gaming friends--Puerto Rico, Princes of Florence, and Easter Island (one of my heavy strategy games). Close friends--Settlers, Cluzzle, Guesstures, Werewolf, Cranium, Apples to Apples, Elfenland, and all sorts of card games. MP: Back to your own games, Cluzzle is your first release from North Star games. What can we expect from this new game company? DC: North Star Games plans to produce high quality games in every genre imaginable. We are currently working on social games that mainstream America would be comfortable playing. Once we have created a customer base that trusts our brand, we plan to slowly introduce strategy games of increasing complexity. MP: What exactly is Cluzzle? DC: A Cluzzle is simply a clay puzzle. Every player creates one of these clay puzzles at the beginning of the game. A good cluzzle is something that is almost recognizable, but can only be figured out after several yes/no questions. Since the game rewards poor artistry, many hilarious situations arise during each game. MP: I know you've played a lot of Cluzzle over the last few years. I enjoyed the game a lot when we played it at Protospiel in 2002. It was good for many laughs and some seriously fun guessing. Do you have a favorite moment that comes to mind--maybe a particularly fun Cluzzle or hilarious guess? DC: My favorite Cluzzle moment is actually the entire evening when songwriter Alanis Morissette came over for a game night earlier this year. She created one of the game cards for the first print run, and strangely ended up drawing her own card. I was proud of my wit when I responded with "Isn't it ironic?" MP: How did you get Alanis Morissette to create a card for you, not to mention come over and play your game! DC: I'm as surprised as anyone that Alanis took the time to make a game card for Cluzzle. She actually knows my parents on a professional level, and my Dad contacted her soon after our business plan started incorporating getting celebrities to make game cards. Not only did she create a great game card, but she wrote a few paragraphs for our website explaining why she chose her subjects. When I went to California to visit my parents for Christmas, we decided to organize a game evening so Alanis could play Cluzzle. She came over around 7pm and we talked and played games till well after midnight (Cluzzle, Guesstures, and a variation of quick Scrabble). MP: Did she enjoy your game? DC: It seemed like she had a wonderful time playing Cluzzle. There was lots of laughter and afterwards, she asked for a copy of the game. As people were leaving, she suggested having more game evenings in the future. Then she proclaimed that the next game night would be at her place! I saw no reason to argue. MP: The first game I played that you designed was what became Easter Island. As you said, it's a pretty heavy strategy game. Now it seems you're focusing more on social or party games. Does this reflect your personal taste in gaming at this time? DC: There was a long period in my life when I only played deep strategy games. Looking back, it seems like I had something to prove, perhaps to my father who taught me chess and entered me into countless tournaments when I was four. Now I seem to enjoy strategy and social games equally. MP: I see at your site that you want to combine "fun and philanthropy". In what ways are you doing this? DC: North Star Games will give 10% of all on-line profits to charity. This means that anytime the owners take money out of the company, North Star Games will also give money to charity. I am excited about giving back to the community at the same time as I grow the company. Only time will show if we can pull it off without going belly-up! MP: What's been the hardest part of brining your game from concept to final production? DC: The most difficult part was in giving up rules that I had spent hundreds of hours to create. Coming from the European tradition, it had seemed like Cluzzle could not get simpler. When I played the game with a group of business students, I realized several of the rules were confusing to non-gamers. Although I had to throw out one of my favorite mechanics, at least I'll be able to use it in a different game. MP: Was it hard to keep going during the many months the game was being developed? DC: I still go through sleepless periods--like last night--because I am worried about the path I am taking. My classmates are currently landing high paying jobs while I am faced with the prospect of over-working myself, losing my shirt, and having a resume that looks misdirected and weak. Of course, there are just as many times when I feel like I am on top of the world because I am doing exactly what I want to be doing with my life. What keeps me focused is a deep-rooted belief that bringing great games to the US will be more fulfilling for me than any other option. Not only do I believe in the quality of Cluzzle, but I trust we'll be able to continue bringing equally great games to market in the future. So yes, it can be very hard at time, but it is also very rewarding. MP: Now that the first print run is complete, what's been the most rewarding to you personally? DC: I am very proud of how professional the final product looks, but I am happiest while watching people have a great time playing the game. Another thing that makes me smile every time I see it, is a chair in our living room that we made out of hundreds of boxes of clay. We call it the "Cluzzle Throne". I'll try to get a picture of it on the website sometime this month. My roommates have been very supportive and lenient with me. At one point we had over 400 boxes in our living room as we tried to get our first batch of games collated! MP: I'm sure producing Cluzzle and running a new company is taking much of your time, but I wondered if you had any other game designs in the works. DC: I have completed about 7 designs over the past 15 years that are good enough for market. As a game designer, I am a perfectionist and have a hard time letting go of the creative process. North Star Games will choose designs (my designs or other submissions) that make the most business sense based on our product line. Then we will playtest the game hundreds of time with our target audience before releasing it to the public. I am a firm believer that great games must be tested for years before they have the polish we are seeking. Right now, we are looking at producing a game that is already in the public domain, mostly because it has gotten sufficient testing from countless gaming groups over the last 15 years. MP: Dominic, thanks for taking the time to do this interview with us. I hope you enjoy much success through your games and your new company. DC: Thanks Mike. This is the first interview I've ever had and it's been a great experience for me. It is good to slow down from my normal hectic pace and contemplate basic questions like, "Why am I starting a board game company?" It has helped reaffirm my commitment to the company. I truly appreciate how supportive you're being of my game and company. Thanks again.